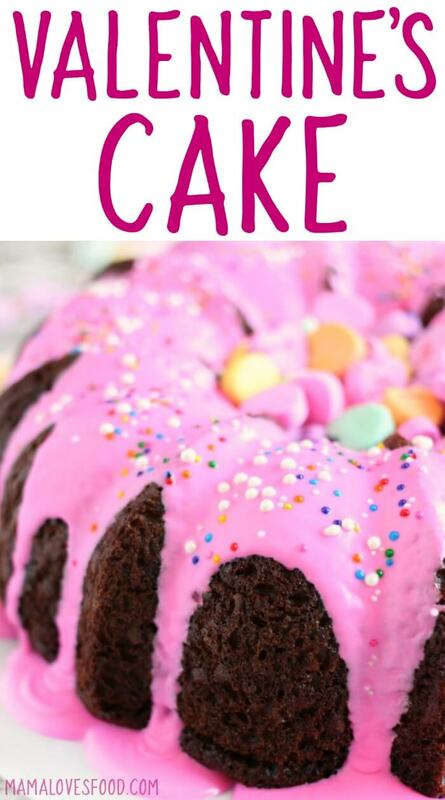 This Valentine’s Cake is as easy as it is cute! 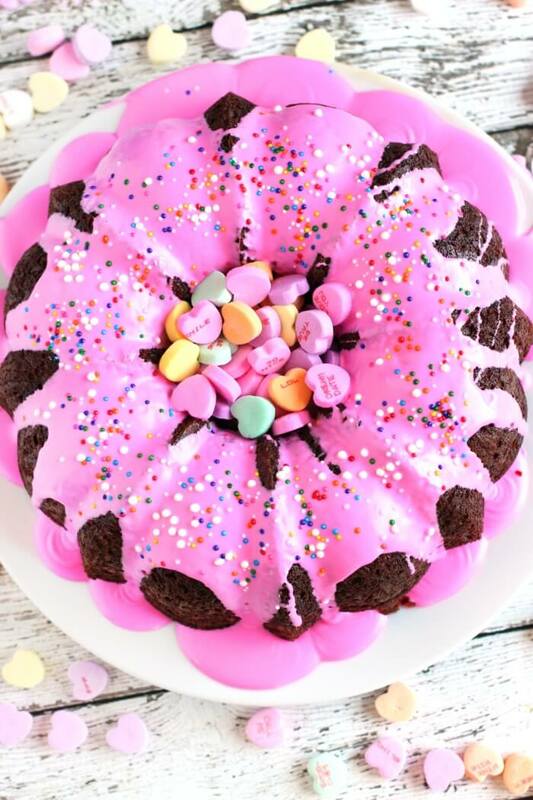 Make our yummy Valentine’s Day Bundt cake with candy conversation hearts for the sweetie in your life! My kids LOVE themed cakes, and this Valentine’s Cake is no exception! I love it, because we use a bundt cake pan and I am currently a billion percent obsessed with bundt cakes. The thing that’s so fantastic about bundt cakes is they look fancy straight out of the pan. Even though you didn’t do anything special! 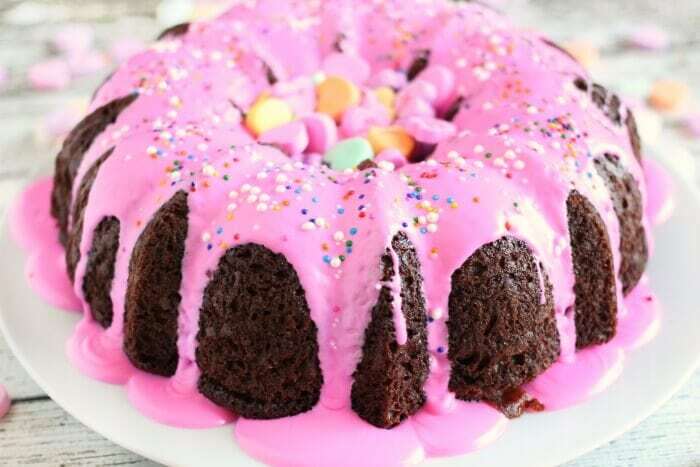 We made a monster themed bundt cake for Halloween, so as Valentine’s Day rolled closer, I figured a Valentine’s cake was the next natural step. 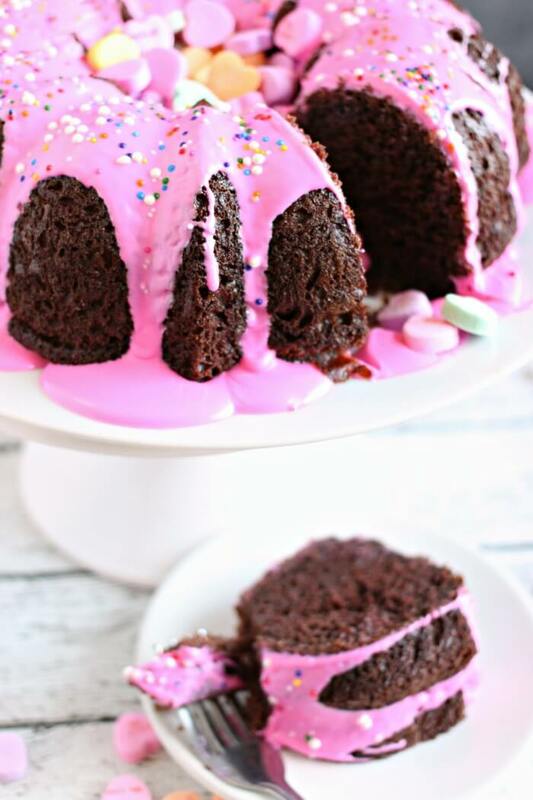 With bright pink icing, colorful sprinkles, and of course the quintessential Valentine’s candy – conversation hearts, this cake is sure to be the center of attention at any Valentine’s Day party you bring it to! It would also make a super sweet girl baby shower cake! Just skip the conversation hearts, of course. Make it in blue for a boy baby shower cake! You could even do a gender reveal cake with blue or pink colored candies hidden in the middle and yellow icing on the outside. Ohhhhh, someone needs to get pregnant soon, so I can do this! We start our Valentines cake with a box mix, but use a few fun tricks to make it taste rich and decadent like a bakery cake with a few easy tricks! Start by switching the water for whole milk. Yummmm. Then, instead of using vegetable oil, use the equivalent amount of melted butter. Finally, add one extra egg! Those tips will get you a nice moist and rich cake – but if you want to level it up again, there are two more tricks you can use! Finally, add about a half cup of chocolate chips (or white chocolate chips if it’s a white cake) to the batter. Mmmmmm. Just one more delicious layer of flavor. No one will ever guess that you started with a box cake mix if you use these handy tricks! Check out these Amazon affiliate links for all your Valentine’s Cake making tools! 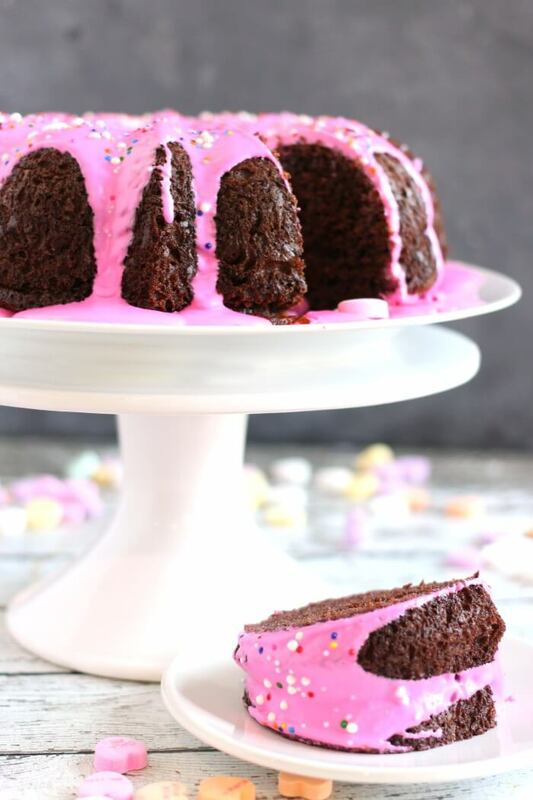 Nordicware Bundt Pan – This is the exact pan we used for this Valentines cake and the same one you see me use on our live show all the time! I. Love. This. Pan. Classic White Cake Stand – Everything just looks fancier on a glossy white cake stand. Even pizza. Don’t ask me how I know that. Baking Release Spray – Short of making your own baking release, this is the best baking release I’ve ever found. We have never had a cake stick when using this spray. It’s the bessssssst. Conversation Hearts Candy – It’s not Valentine’s without conversation hearts! I feel like they’re in the same family as candy corn, you either love them or hate them. It’s alllll love for me. What about you? Colorful Sprinkles – These are the little round sprinkles I want to put on errrrrything. All. The. Things. My kids love my obsession with sprinkles because p.s. even yogurt is more fun with sprinkles. 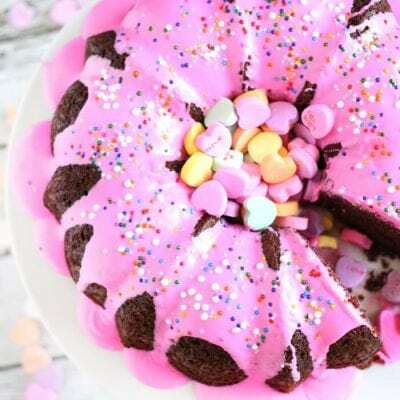 If you love our Valentine’s Cake recipe, be sure to check out these other awesome recipes perfect for your Valentines! Two Ingredient Strawberry Dark Chocolate Fudge – This fudge is sooooo easy to make, and no one will know you didn’t slave over the candy thermometer! The basic recipe is just two ingredients and you use the microwave! Whaaa?! Flourless Dark Chocolate Mug Cake for Two – Sometimes I really want cake, but I don’t want to deal with the oven and all that other nonsense. That’s when this super decadently delicious Dark Chocolate Mug Cake enters the room and sweeps me off my feet. Mmmmm. 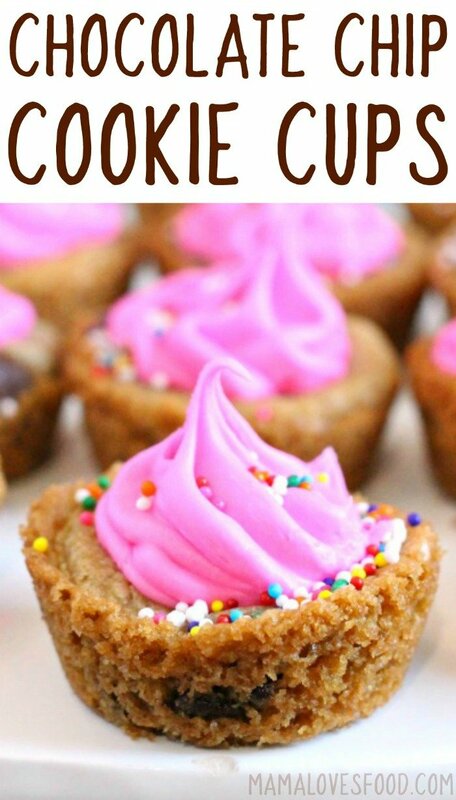 Chocolate Chip Cookie Cups – We made these cookie cups filled with hot pink icing for my daughter’s sixth birthday (OH EM GEE, how is she six?! ), but they’d be the perfect Valentine’s Day treat too! 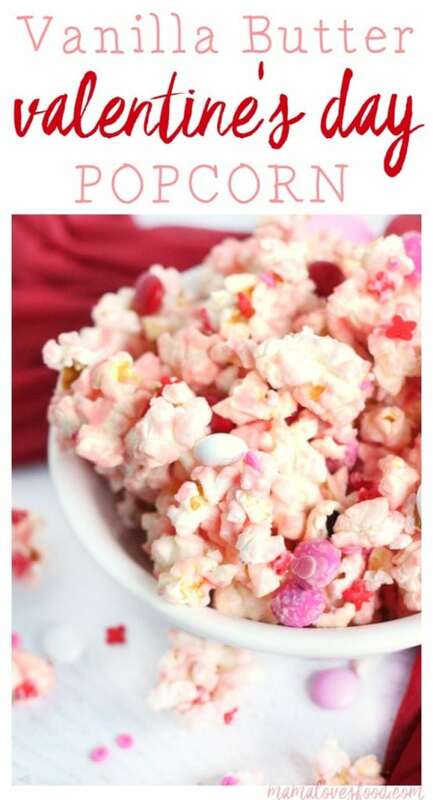 Vanilla Butter Valentine’s Popcorn – If you’ve never made Vanilla Butter Popcorn, stop what you’re doing right now and make it. Just DO IT. Seriously, you are sooooo missing out! This popcorn is the heavenly baby of sweet and salty perfection. Valentine’s Day Pudding Cups – These Valentine’s Day Pudding Cups are such a fun treat for the kids! I like to hide a gummy worm under some crushed oreo “dirt” too. So cute! You can also watch us make the Valentine’s Cake on Youtube! Make sure to tune in for all our live cooking shows! 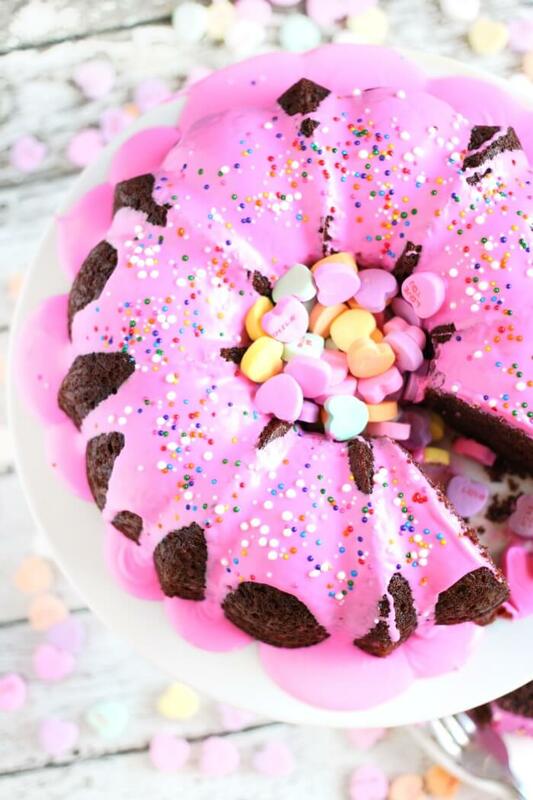 This Valentine's Day cake is as easy as it is cute! 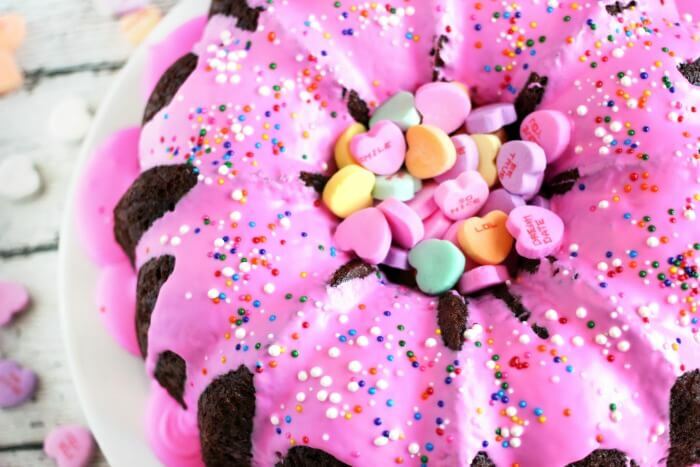 Make our yummy Valentine's Bundt cake for the sweetie in your life! Prepare cake batter with noted modifications (or not, whatever suits you), mix with an electric mixer or electric beaters. Stir in chocolate chips, if using. 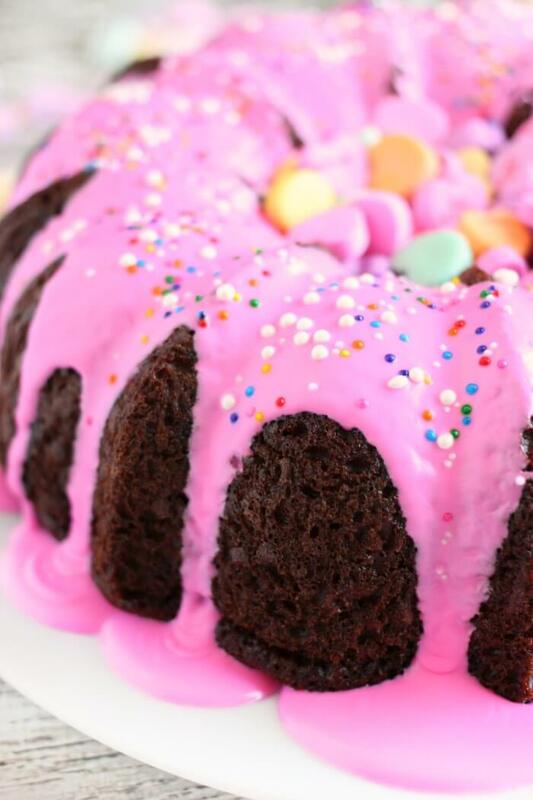 Spray bundt pan with cake release, and bake according to package instructions. While cake is baking, put icing in a bowl and whisk milk into it until you reach a pourable, but still thick, consistency. Add food coloring, and set aside. When cake is done baking, remove from pan and allow to cool completely. Pour icing over top, then add sprinkles and conversation hearts.